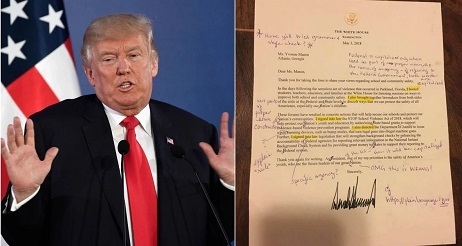 A retired secondary school English teacher has corrected a letter she received from US president Donald Trump and sent it back to the White House. 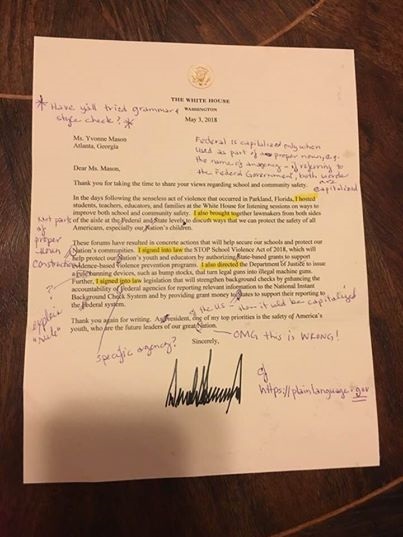 Yvonne Mason, who lives in Atlanta and was a teacher for 17 years, said the letter would have barely passed and corrected its numerous grammatical errors. This included 11 examples of incorrect capitalisation of words such as “president” and “state”. “If it had been written in middle school, I’d give it a C or C-plus. If it had been written in high school, I’d give it a D,” Ms Mason told South Carolina’s Greenville News. She acknowledged the letter was likely to have been penned by a staff member rather than the president himself. “When you get letters from the highest level of government, you expect them to be at least mechanically correct,” she said. In her original letter, she urged Mr Trump to individually meet with the families who lost loved ones at the Stoneman Douglas High School massacre. The world leader previously held a listening session with student survivors of mass shootings, their parents and teachers in the State Dining Room at the White House. The Trump administration has been frequently mocked for its grammatical mistakes. The president has become famed for firing off rambling, inflammatory tweets – which include misspellings, typos and other linguistic errors – to his 52 million followers in the early hours.